New Zealand Tall Bearded Historic Iris "NINA LEVETT"
The very late blooming 'Nina Levett' is often confused with a earlier blooming iris which grows at about the same height named, 'Pink Advance". 'Nina Levett' is the pod parent of 'Pink Advance'. Photo above is from the plant gifted to me by the late Shirley Spicer, of Wanganui. Stevens Bros, Bulls, Catalogue of Irises, 1937-38. A lovely tall pink of regal carriage.The large flowers are an even shade of lilac pink, and are carried on well-branched 4 1/2 foot stems. Exceptionally vigorous. The Iris Society Year Book (BIS) 1942. Awards by the Royal Horticultural Society, Wisley, 1942. NINA LEVETT (Raised by Miss.P.Levett,NZ) A.M. 20th June 1941. Vigorous and of rapid increase with erect, glacous-green foliage, 24 inches tall.Flower stems 48 inches tall erect, somewhat zigzagged,8-flowered. Jean Stevens in 1950 writes in regards to the Levett's. 'As the years went by the quality of their seedlings kept improving, and the flowering season became even more exciting than hitherto. About 1935 they flowered a large new seedling of a bright lilac pink which they named Nina Levett after their mother. This was introduced in England by Orpington Nurseries who sent plants to the Wisley Trial Grounds. In 1941 Nina Levett was given an Award of Merit by the Royal Horticultural Society'. 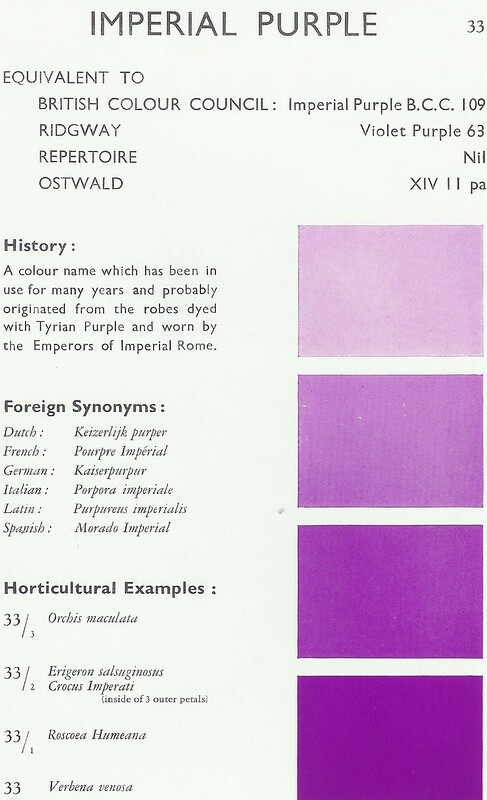 The Royal Horticultural Society colour descriptions,Standards Imperial Purple (33/2) and Falls Purple between (33/1 and 33/2) show how completely inadequate the 1939 Check List colour chart was in it's time and also make the 1939 and 1949 Check List colour descriptions for 'Nina Levett' irrelevant. In the 1934 BIS Year Book (in an article by a Dr. Sansome who quotes Marc Simonet), he states that one of Nina Levetts parents, J. B. Dumas is a triploid with 37 chromosomes. Triploids usually aren't the most fertile of parents, so that makes Nina even more interesting!! It should also be noted that The Royal Horticultural Society state that Nina Levett parentage is (J.B.Dumas X Aurelle.) yet the 1939 AIS checklist entry is (...) X (J.B. Dumas x Aurelle) which the later implies that another Iris was in the mix. 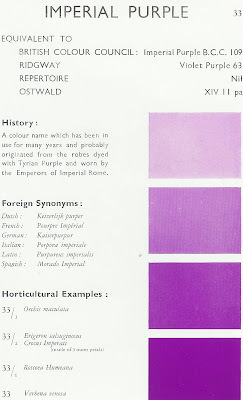 My opinion is that 'The Royal Horticultural Society' in its colour descriptions and parentage 'trumps all'. NINA LEVETT (Miss P. Levett, R. 1939). TB, VL, B1L; (...) X (J.B. Dumas x Aurelle). Orpington. 1939. It would not be unrealistic to state that the few irises growing in New Zealand as 'Nina Levett' are wrongly labelled and I am somewhat reluctant to post New Zealand bred Irises on this blog as it leads to a deluge of 'look-a-like' irises, and some not even remotely 'look-a-like' irises, listed for sale on the internet as the real deal, and it it is not in anybody's interest to add to the existing large pile of very expensive miss-named irises that live in the cyberspace known as 'Trade Me'!!!! New Zealander's interested in heirloom irises need to have a confidence in their ability to Identify Irises and not merely accept that because an Iris was received or purchased with the name given it is true to label, after all these are New Zealand raised Irises, surely we should have some idea of our Iris heritage!!!! Quite the little surprise package is this New Zealand bred Intermediate Iris which grows along side 'Moon Tike' and are two of the very late flowering Intermediate Irises in our collection. A high health plant which grows well and always shows good increase and would adapt well to growing in most gardens. Slight but nice scent. LUCY'S BLUE SILK (L. Delaney by H. Catton, R. 1985). IB 24" (60 cm) M-L. Light sky blue; white beard. Unknown parentage., Catton 1986/87. Not sold commercially in New Zealand, but if you can find it I recommend you buy or trade it. An article in the AIS bulletin 353, April 2009 "Unsung Heroes of the Plant World" goes on at length espousing the advantages of joining a plant society - no doubt admirable thoughts. This blog has always promoted joining reputable plant societies. But societies can undo decades of trust and creditability by promoting, selling or registering Irises with dubious names. Take for instance a recent event. A lady (Who I shall call Mrs.B) from the district where I live attended an Iris show in Palmerston North in 2007. This show was sanctioned by the official Iris Society of New Zealand. The lady purchased an Iris labelled 'Beverly Sills’ from the sales table and was told the colour would be pink. Nothing wrong with this so far. When she got home Mrs.B tipped the iris from its pot and was about to plant it when another label was discovered which read ‘Sapphire Hills’.This is where I entered the frame. When Mrs B. rang me explaining the circumstances I said she now had a chance of growing either a really good pink or a really good light blue. Had it turned out that way it would have been an compromise as Mrs B. really wanted a Pink Iris but an acceptable result. 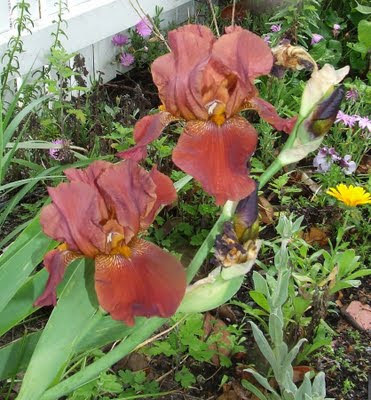 Problem is when the Iris flowered it was a red brown blend (photo above) that no one knows the name. Mrs B. has now pulled the iris from the garden and is now looking for a nice pink Iris to replace it. There is now one really disappointed member of the public who when this Iris group is mentioned is not slow in coming forward and telling the story above. From what I have been hearing lately this is far from a one-off. Where does the author of this article slot the above described scenario when he states, “ Societies promote the dissemination of accurate information and sponsor research to learn more. They are the reliable sources"? The New Zealand club goes and publishes the same article in its own booklet just recently. Maybe the editor included it as an example of something they could aspire to. Border Bearded Historic Iris "JUNGLE SHADOWS "
'Jungle Shadows' tucked away among the peonies growing in its own little jungle at home . A sultry toned Border Bearded Iris of ideal proportions introduced in 1960, receiving the Knowlton Award in 1962. Registered by Helen Graham after the death of the originator Henry Sass. I treasure this iris for the chaos of colour and when introduced it no doubt created a step change in how we view and perceive what an Iris should look like. Chaos and controversy is always a great combination, well it is in my world. Melrose Gardens, Route 1, Box 466, Stockton, California, 1960 Introductions. The following Iris co-introduced with El Dorado Gardens, El Dorado, Kansas. Exotic and other-worldish. A color break for sure. The dusky grey base color is overblended and flushed with lavender, brown, olive and purple. A deep brown beard leads you to the mysterious depths of the flower. The standards are a mixture of grey and brown. These colours are flecked and stained throughout the petals which are further washed with a tint of dull violet brown. Inside the petals is a flush of purple. The ginger coloured beards are tipped with grey.This hybrid was introduced after the death of the hydbridizer. Height 99cm (39½ in.) Bloom mid season. Fleur de Lis Gardens, Sioux City, Iowa. 1965 Catalog. An odd blend of grey, with a flush of bluish purple and bamboo yellow which gives the flower a grey-olive color. Made further intriguing by a dark beard and violet-tinged hafts. JUNGLE SHADOWS (Sass-Graham, R. 1959). Sdlg. 1-57. BB 26" M. V5D. Blended brown-gray and purple; brown beard. Black Delight x sdlg. 54-95., Melrose 1960. Tall Bearded Heirloom Iris "SUNSET SNOWS "
October 2009 is on record of being the coldest October in New Zealand since 1945, just witness the frost damage to the edges on the standards and falls in the above photo, and we had plenty of rain as well. This incessant combination of heavy frosts quickly followed with heavy rain has turned most of the early iris blooms into mush, and just when I was thinking there is not to be any photos of early varieties to take this season for the blog, Jean Stevens 'Sunset Snows' begins to bloom and becomes 'the save of the weeks'. Plant has great increase, bloom stems are a bit short 68cm (27") and I have never been able to grow this iris to its registered height 92cm (36"), branching is best described as average and it is a problem for an iris with such a high bud count making the blooms bunched. Blooms form is plain with no ruffles and a narrowing in the falls giving the bloom a modern tailored look. 'Sunset Snows' colour combination of pure white standards, cocoa pink falls coupled with a tangerine beard was a complete colour break at the time of introduction and is still greatly admired today. 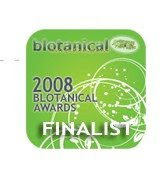 With a early and long bloom season and as already mentioned a high bud count, fertile both ways, and producing seed that germinates easily which is not common for a recessive amoena made it a winner for hybridisers. Sunset Snows has proven to be such an important ancestor to modern tangerine bi-colours. The registration pedigree is very vague but interestingly with the Pod parent 'Youthful Charm' the information Jean wrote on the registration application shows the parentage stems back through seven generations before a named variety figures in it's pedigree, then 'Pink Cameo' and 'Flora Zenor' appear also 'Pinnacle'. Then it is another three generations back to any other variety. In 1967 at the Florence International Iris Garden Competition 'Sunset Snows' received three awards. It won the Piaggio Cup for 'Best early Variety', the Cup of the Florence Garden Club for the 'Most original Colour' and Third place in the Judging for the Premio Firenze. This was the first time any prizes in this competition had come to the Southern Hemisphere, and an unprecedented result for any variety in that one cultivar had collected three prizes . 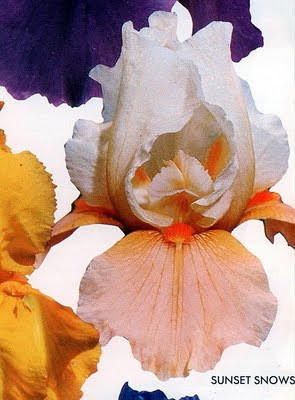 A very special Iris used extensively by other breeders. Bicolors and Amoenas Where to from Here? Barry Blyth. A few words about Sunset Snows because as far as I am concerned, Jean Stevens began a colour revolution when she introduced this iris. It is a shame she is not with us to see the glorious iris that eventuated from her work. SUNSET SNOWS (Stevens '65 New Zealand) M. 36". Standards white. Falls cocoa-pink, red beards. YOUTHFUL CHARM X sdlg; from yellow amoena crossed pinks. This is all that is said about it in the AIS Iris checklist 1969. For me it only reached 32": Branching was very tight, but Bud count was amazing. When well grown there would be an average of 10 to 12 per stem. Also it could produce multiple stems per rhizome. Plants were very small but made abundant increase. First generation crosses gave a range of colours when crossed to non bicolours, such as pink and purple-black bicolours and yellow amoenas. Also dark, near black red bitones like LOCAL COLOR and ROMANTIC EVENING colours. So this is one area where these colours came from in today's Iris. It also gave plenty of selfs. All the seedlings were plain and form and generally branching was tight, but bud count was good. They were nearly all very early, flowering with the dwarfs. Barry also more recently made these comments on his website "Our friend Keith Keppel recently had enough time and the urge to track down the family tree of a seedling we had flowered a couple of years previously and we were particularly interested in the reasons for some of its unusual characteristics and he said that one of its ancestors, Sunset Snows, appeared over 1200 times in its background. That is just one of the dozens of varieties that make up its complex family tree. Think of all the seedlings viewed over the 50 years by all the different breeders and work involved just in that one variety alone. It is quite amazing and also wonderful that all these records are available and can be tracked by anyone. 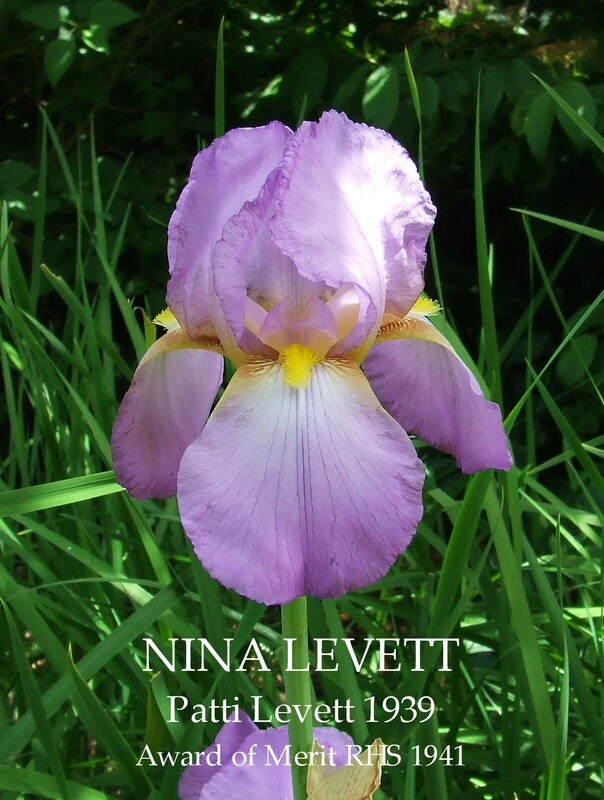 It is often easier to track an Iris variety’s pedigree and background than it is to track ones own family history". Wanganui Irises, Putiki, Wanganui, Irises 1965-66. Here is a sensational new colour combination that Mrs. Stevens has developed from her original pink Amoena strains. Beautifully held, waxen white standards contrast harmoniously with flared and ruffled falls of a warm cocoa toned pink enlivened by a red beard. This completely new colour combination is truly sensational, charming, novel - and crowd-stopping. An iris which makes one wonder if there will ever be any end to the extent and range of colours and colour combinations which may be bred into irises. A very lovely novelty we are proud to introduce. 2½ft. 50 shillings. SUNSET SNOWS (J.Stevens) A huge clump of this Iris which won third prize in the 1967 Trials, carrying some twenty spikes, caught my eye on first entering the iris gardens, and by the end of the week when most of the plants where in flower, it was still, to my mind, the most attractive iris in the garden.It has pure white standards and horizontally-flaring falls of milky, tawny pink with a brownish infusion at the hafts. From a distance of 50 feet or so, it appears as an absolutely clean, deep-pink amoena and is most striking and attractive. Schreiners Iris Lovers Catalog, 1967. Sunset on a snow capped peak truly visualizes this most impressive iris. It incorporates pure waxen white standards with contrasting, harmonious warm, cocoa toned pink falls - all enlivened by a red beard. A novel, eye catching amoena. Well-branched stems, medium sized, flaring flowers. SUNSET SNOWS (Mrs J. Stevens, R. 1963). 2-k28-54. TB, 36", M, W4. S. white; F. cocoa pink; red beard. Youthful Charm X sdlg. from yellow amoena crossed pinks. Wanganui 1965. 3rd Prize Florence Cup of Florence,Garden Club,(For most original colour) Piaggio Cup 1967 (For best early variety).